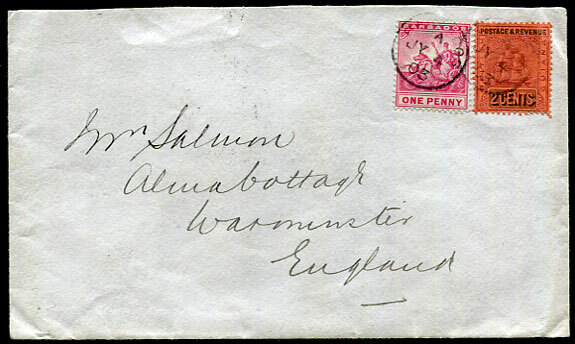 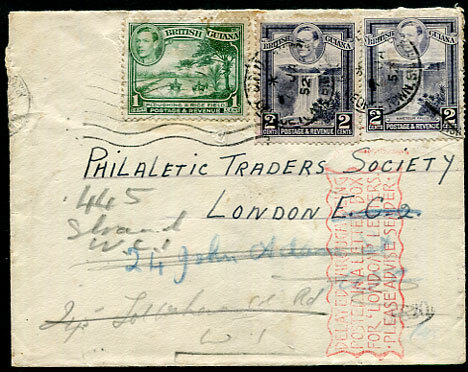 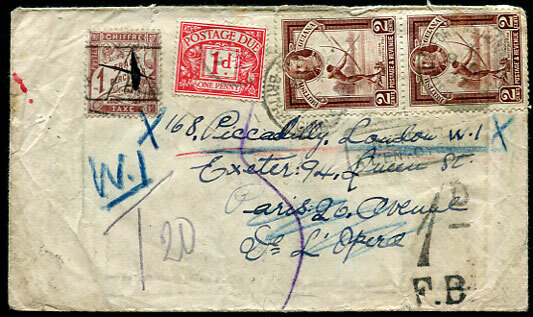 1903 cover to Warminster, England with most unusual and accepted mixed country and mixed currency franking of Barbados 1d and British Guiana 2c tied BARBADOS A/JY 4 03 cds, Bath and Warminster backstamps. 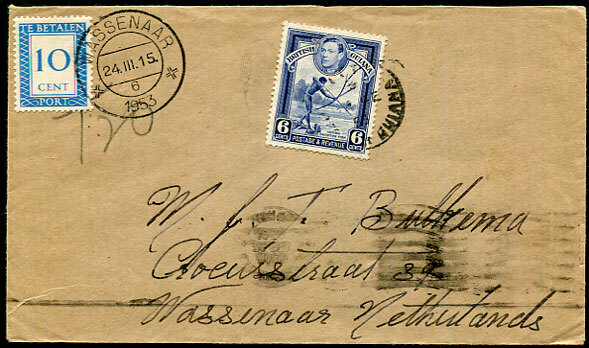 1953 underpaid cover from Kitty (per reverse sender address) with KG6 6c indistinctly tied to the Netherlands marked "T20" with 10c Postage Due tied Wassenaar 24.111.1953, reverse GPO Georgetown machine dated NOON/24 FEB 1953. 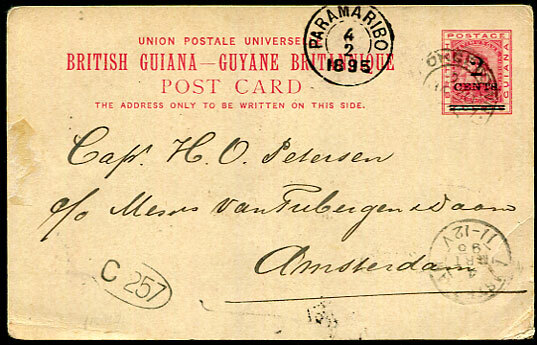 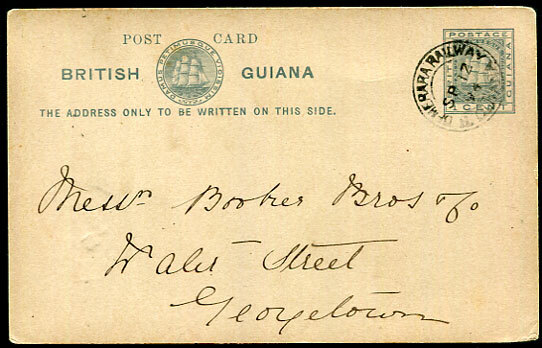 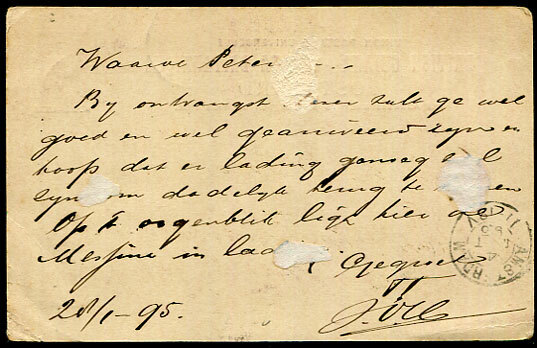 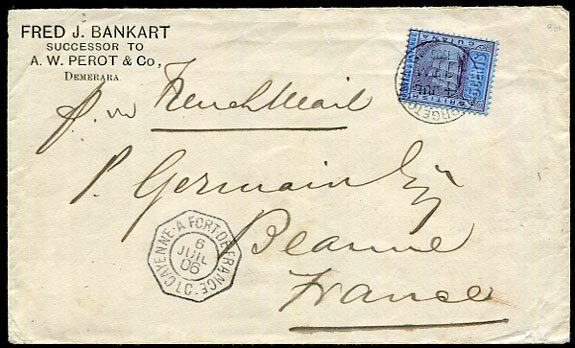 1895 use of "2 CENTS" on 3c carmine Post Card pmk'd Georgetown JA 30 95 routed through Surinam with PARAMARIBO 4/2/1895 d/ring to Amsterdam, Holland, some faults. 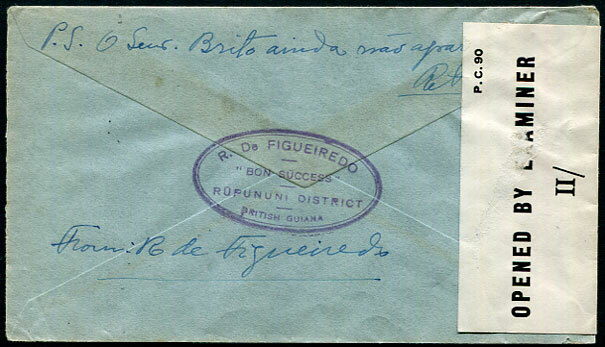 1941 cover marked "By 1st Air Mail" from R. De FIGUEIREDO, "Bon Success", RUPUNUNI DISTRICT to Georgetown with pair KG6 6c lightly pmk'd RUPUNUNI */OC 5 41 cds censored due Spanish language with OPENED BY EXAMINER II/ label. 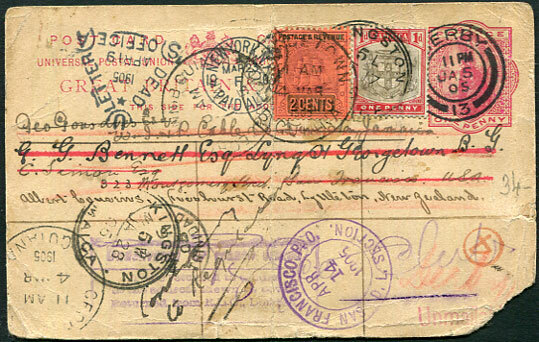 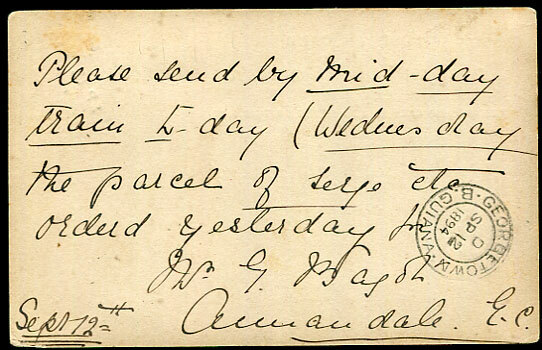 1894 use of 2c grey/cream Post Card written Annandale E.C. 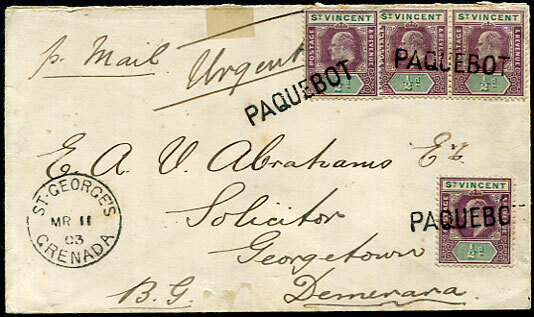 to Georgetown pmk'd DEMERARA RAILWAY SP 12 94 d/ring. 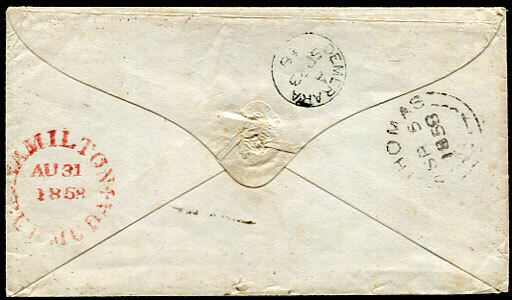 1895 used of 1c slate Post Card written "Hope. 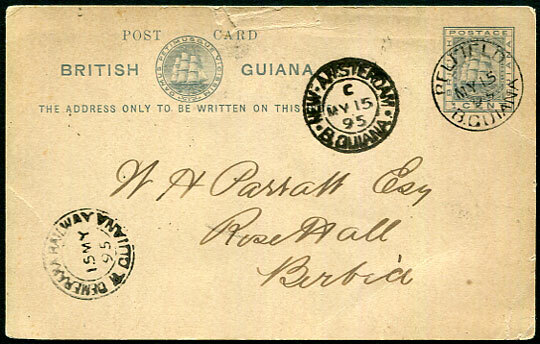 May 14/95" to Rose Hall, Berbice pmk'd BELFIELD MY 15 95 with DEMERARA RAILWAY and NEW AMSTERDAM same day transit and arrival. 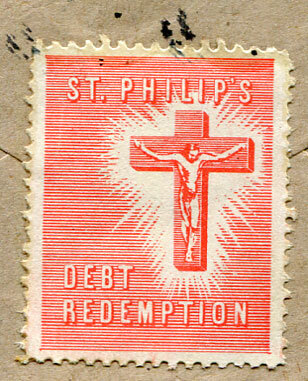 Some edge damage. 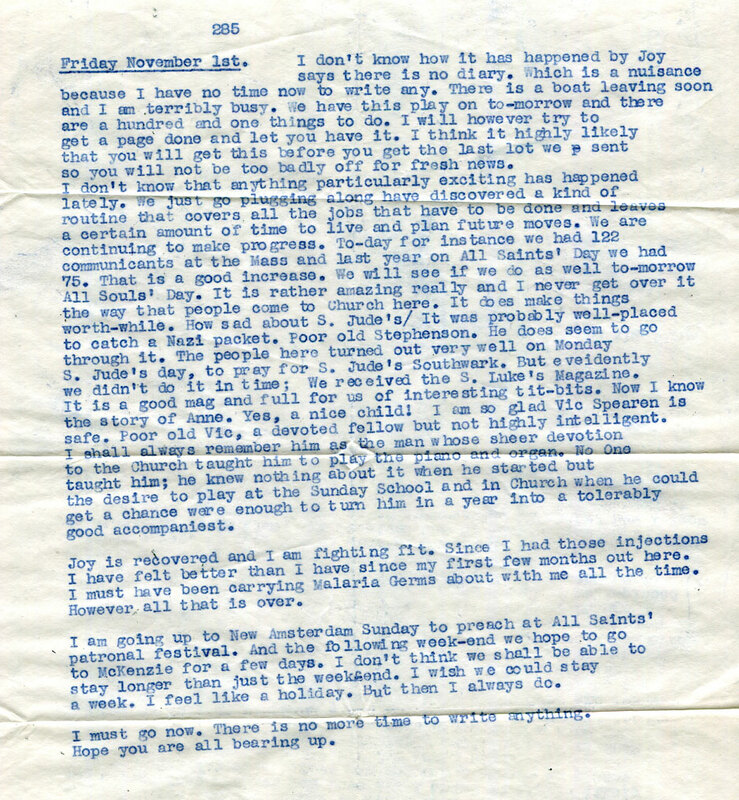 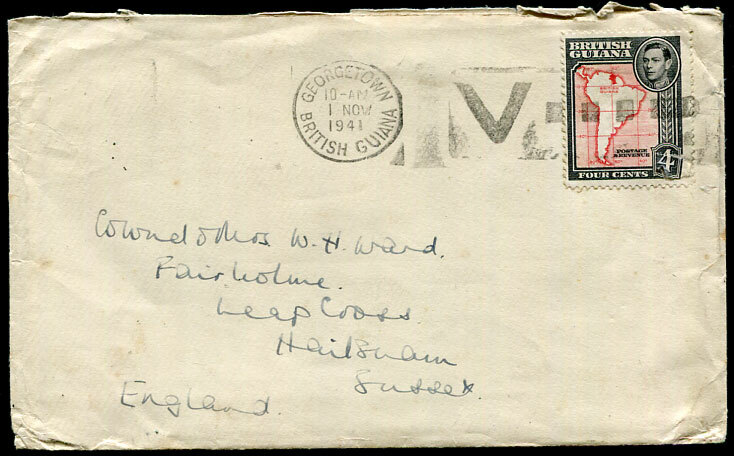 1941 (NO 1) cover with typewritten newsy letter with "How sad about S. Judes's/ It was probably well-placed to catch a Nazi packet" from Rev. 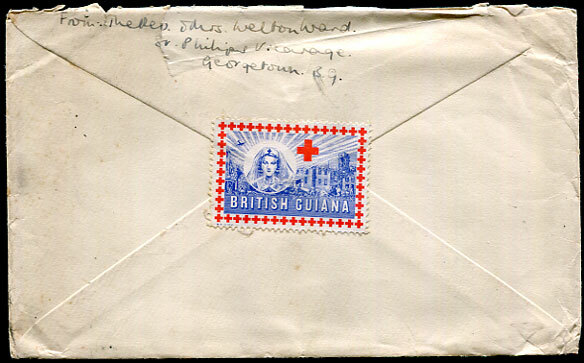 Welton Ward, St. Philip's Vicarage, Georgetown to Leap Cross, Hailsham, Sussex with KG6 4c (defective lower right corner) tied Victory "V - - - - " machine cancel dated 1 NOV 1941, Red Cross label ties reverse flap. 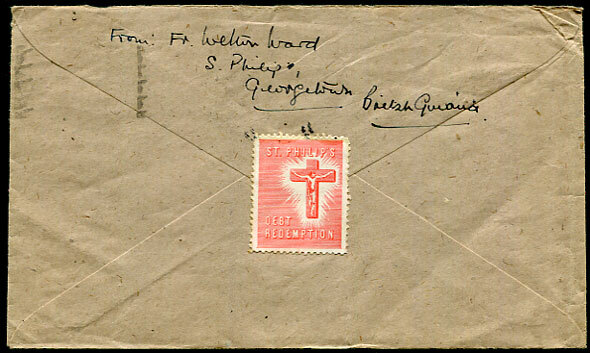 1942 cover from Father Welton Ward, St. Philip's Vicarage, Georgetown with their own church label tied by ink marks to reverse of cover to Leap Cross, Hailsham, Sussex with 2 x KG6 2c tied Georgetown 20 MCH 1942 machine cancel. 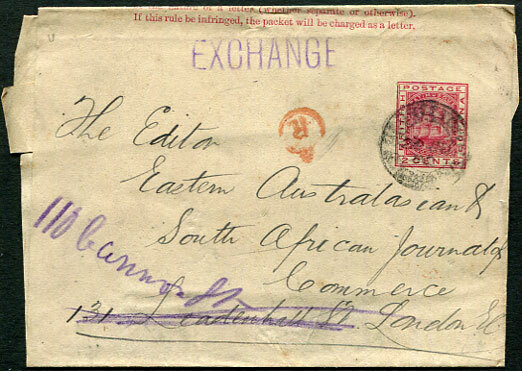 1892 use of 2c carmine newspaper wrapper pmk'd Georgetown 29 JU 92 sent enclosing "Exchange" publication to The Editor Eastern Australian & South African Journal of Commerce, London with Crowned "R" to indicate free within London re-direction, applied once even though re-directed Leadenhall Street and to Cannon Street, matching red London JY 14 92 backstamp. 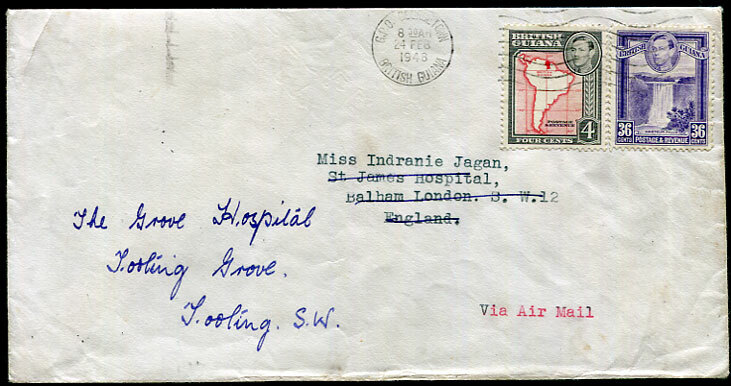 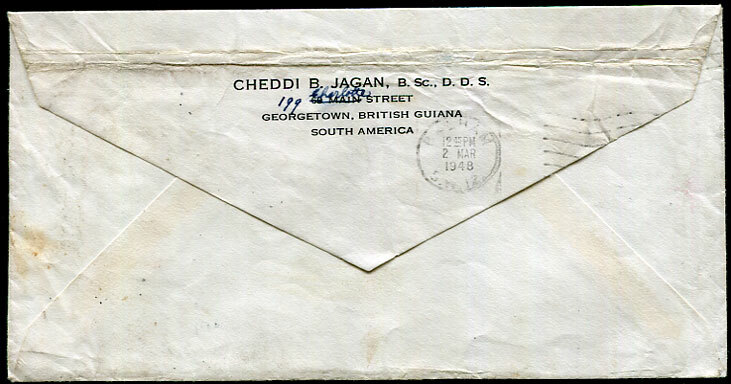 1948 printed flap cover from Cheddi Jagan to his eldest sister Indranie at St. James Hospital, Balham re-directed The Grove Hospital, Tooting with KG6 4c, 36c tied GPO Georgetown 24 FEB 1948 machine, flap with soiled creasing. 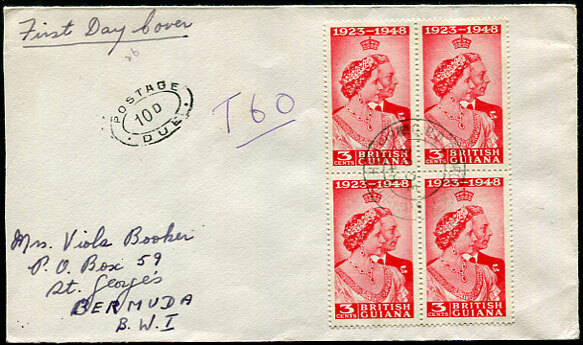 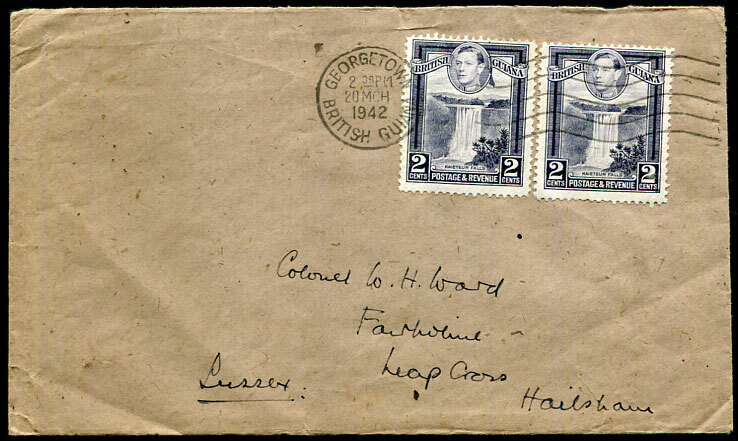 1948 (DE 20) underpaid cover to St. Georges, Bermuda with KG6 RSW 3c block of four pmk'd Georgetown, taxed with POSTAGE/10d/DUE added on arrival, slightly shortened at left. 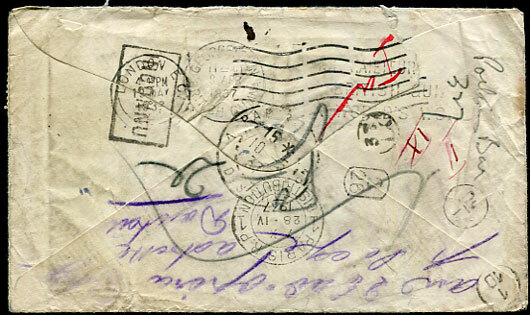 1958(?) 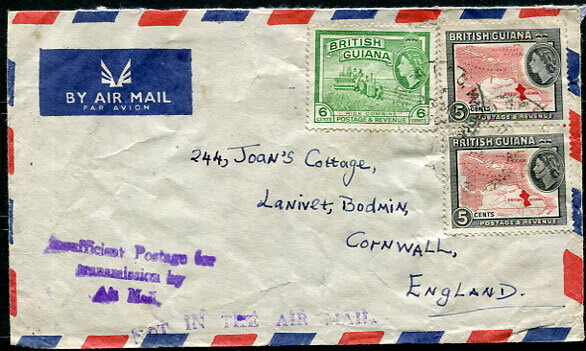 cover to Bodmin, Cornwall with QE2 5c pair, 6c pmk'd 23 MY with purple "NOT IN THE AIR MAIL." 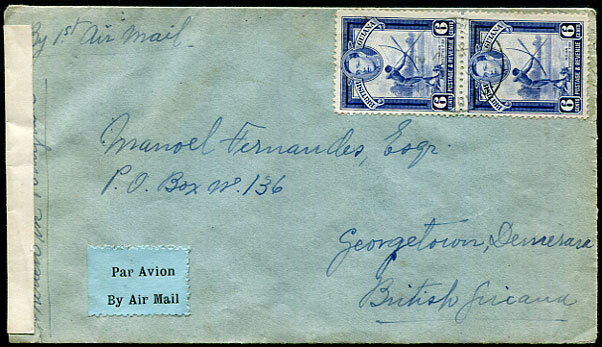 and 3-line "Insufficient Postage for/transmission by/Air Mail." 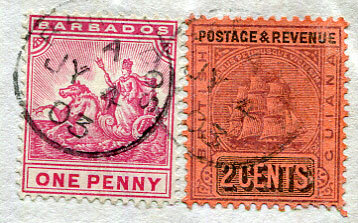 handstamps. 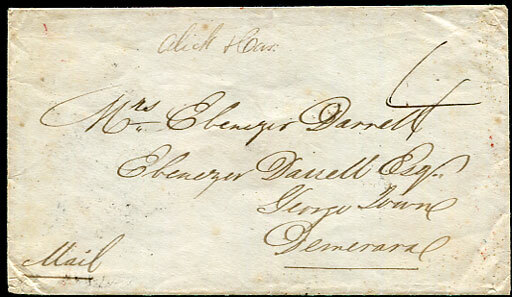 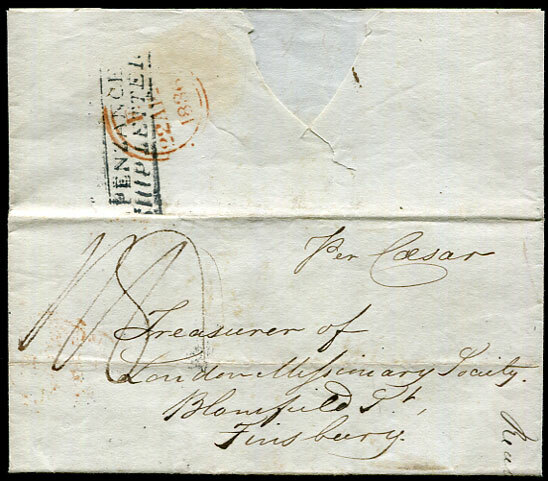 1858 cover to Mrs. Ebenezer Darrell, Georgetown, Demerara rated "4" unpaid, reverse HAMILTON (red PM4) AU 31 1858, ST. THOMAS SP 5 1858 dbl-arc transit and DEMERARA A/SP 23 58 arrival cds. 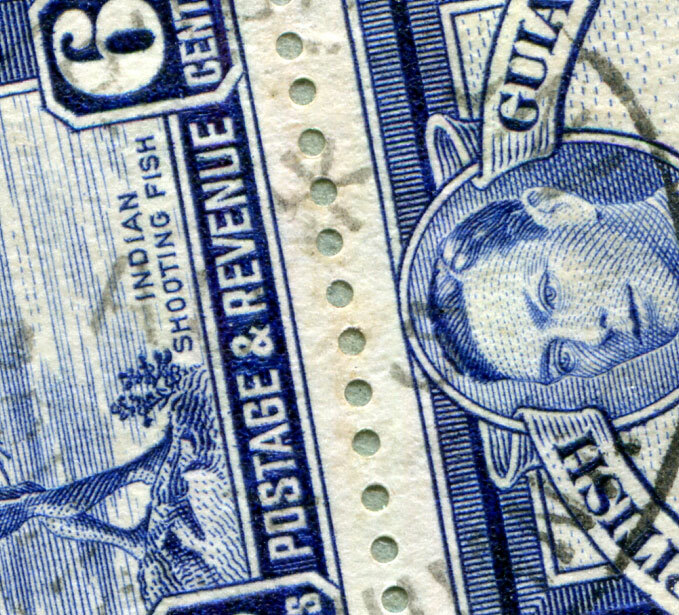 Ex LUDINGTON (1999). 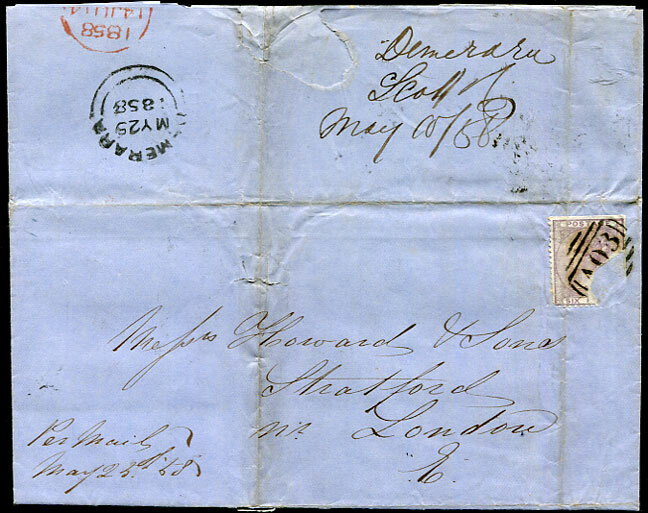 1858 entire headed "(Duplicate) Demerara May 10th 1858" (being the date GB stamps placed on sale having arrived the day before on the MY 9 1858 steamer) with lightly creased and badly defective GB 6d pmk'd crisply struck "A03" to London with DEMERARA MY 25 1858 despatch dbl-arc. 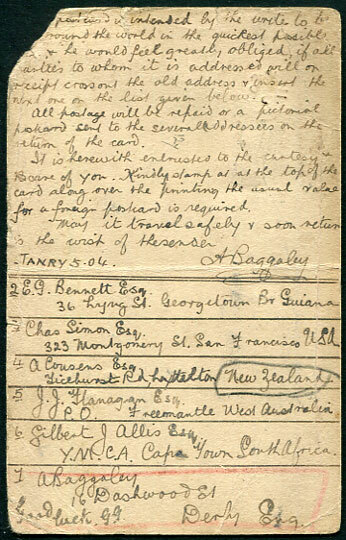 A significant item documenting the Second Sailing with duplicate of First Sailing letter.